Adress: Bukowskis, Berzelii Park 1 i Stockholm. Catalog with one object per side and complete catalog text or multiple objects per side, includes description and provenance. We could unfortunately not create the requested document. Please make sure that the lot numbers entered are part of the auction, or, if you selected "favourites", that you have favourites in this auction. 1. 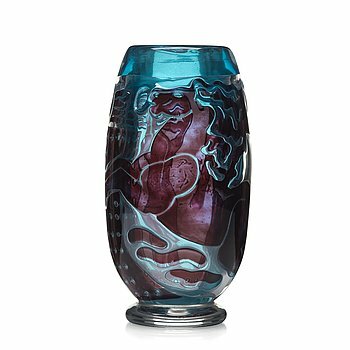 Karl Lindeberg, an Art Nouveau cameo glass vase by Kosta, Sweden. 2. Karl Lindeberg, an Art Nouveau cameo glass vase, Kosta, Sweden, model 103. 3. Edward Hald, a Graal vase, executed by Knut Bergqvist and Heinrich Wollman, Orrefors, Sweden 1920. 4. Edvin Öhrström, an ariel glass vase, Orrefors, Sweden 1942, no 242. 5. 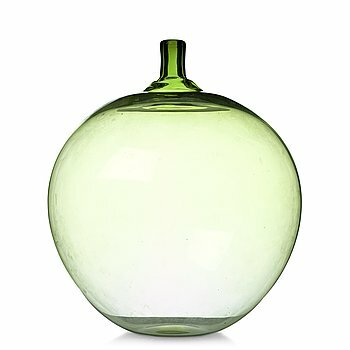 Ingeborg Lundin, a green "Apple" glass vase, Orrefors, Sweden. 6. 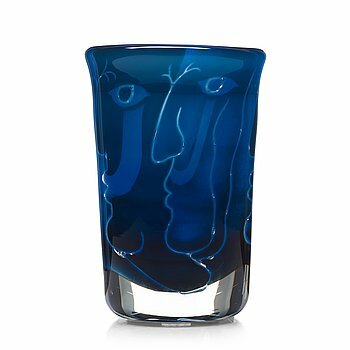 Ingeborg Lundin, an ariel glass vase "Faces", Orrefors, Sweden 1971. 7. 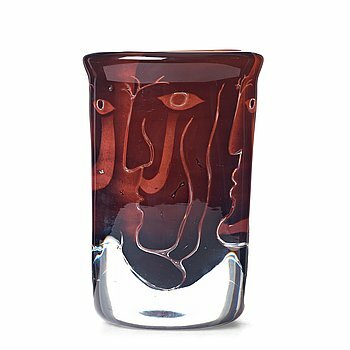 Ingeborg Lundin, an ariel glass vase "Faces", Orrefors, Sweden 1971. 8. 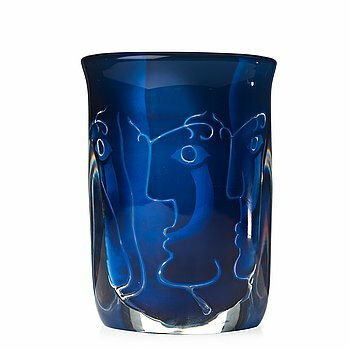 Ingeborg Lundin, an ariel glass vase, "Faces", Orrefors 1979. 9. Olle Alberius, an ariel glass vase "Komposition", Orrefors, Sweden 1988. 10. 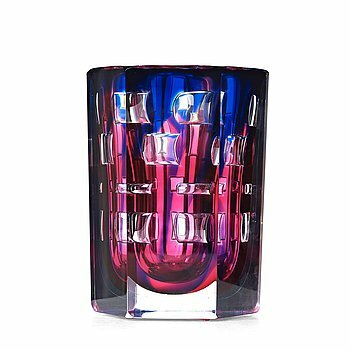 Vicke Lindstrand, a unique glass vase, Kosta, Sweden 1950's. 11. Erik Höglund, an engraved glass bowl, Boda, Sweden 1950's. 12. Edvin Öhrström, a "Korona" cast glass sculpture, Lindshammar, Sweden 1960's. 13. Alvar Aalto, a green tinted glass vase, Karhula, Finland ca 1937-49, model 9750. 14. Alvar Aalto, a green tinted glass dish by Karhula Glassworks Finland, post 1939. 15. Alvar Aalto, a green tinted glass vase, Karhula, Finland ca 1937-49, model 9750. 16. Alvar Aalto, a clear glass vase, Iittala, Finland 1950-60´s, model 3031. 17. Gunnel Nyman, dish "Facett 1", Riihimäen Lasi Oy, Finland 1940. 18. Gunnel Nyman, a "Musselglas" glass vase, Nuutajärvi Notsjö, Finland, late 1940's. 19. Kaj Franck, a "The bells of Kremlin" decanter, Nuutajärvi Notsjö, Finland. 20. Helena Tynell, a "Nothern Lights" vase, Riihimäen Lasi Oy, Finland. 21. Timo Sarpaneva, a mould blown glass sculpture, Iittala, Finland ca 1964-67. 22. 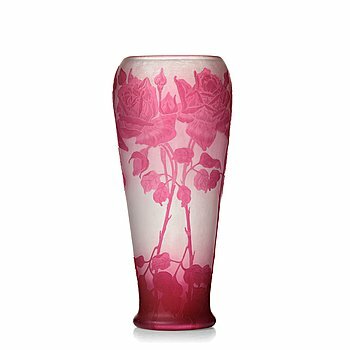 Daum, an opalescent etched and enamel painted glass vase, Nancy, France, 1890's. 23. A Daum Art Nouveau enamel painted cameo glass vase, France. 24. A Daum Art Nouveau enamel painted and etched cameo glass vase, Nancy, France. 25. A Burgun & Schverer Art Nouveau cameo glass vase, France ca 1900. 26. A glass goblet attributed to Vally Wieselthier, enamel painted by Johann Oertel & Co /Haida for Wiener Werkstätte, . 27. 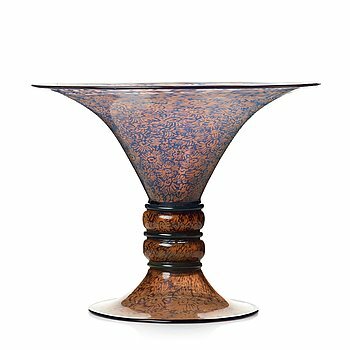 Fulvio Bianconi, a "pezzato" glass bowl, Venini, Murano Italy 1950-60's. 28. Fulvio Bianconi, a set of three "Fasce Orizzontale" glass vases, Venini, Italy. 29. Paolo Venini, a set of three "Incisi" glass candleholders, Venini, Murano, Italy 1950's, model 4809. 30. Paolo Venini, a set of three "Incisi" glass objects by Venini, Murano Italy 1950's. 31. Alessandro Pianon, a "Pulcino" bird by Vistosi, Italy 1960's. 32. Peter Pelzel, a "Pulcino" glass bird, Italy 1960's, model S 193. 33. Alessandro Pianon, a "Pulcino" glass bird, Vistosi, Italy 1960's, model S191. 34. Alessandro Pianon, a "Pulcino" glass bird, Vistosi, Italy 1960's. 35. Alessandro Pianon, a "Pulcino" glass bird, Vistosi, Italy 1960's. 36. Peter Pelzel, a "Pulcino" glass bird, Vistosi, Italy 1960's, model S 193. 37. Alessandro Pianon, a "Pulcino" glass bird, Italy, 1960's. 38. Gunnar Wennerberg, & PEDER MÖLLER, a creamware lidded jar, Gustafsberg, Sweden 1896. 39. 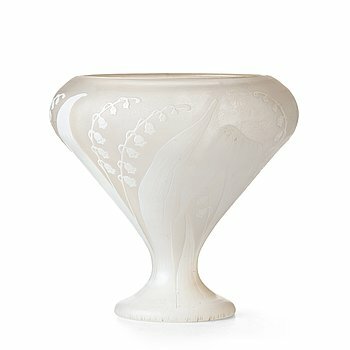 Algot Erikson, an Art Nouveau porcelain vase, Rörstrand, Sweden ca 1900. 40. Alf Wallander, an extensive "Tulip" porcelain dinner service, Rörstrand, Sweden 1902-1915, 104 pieces. 41. Wilhelm Kåge, a "Surrea" vase, Gustavsberg, Sweden ca 1940. 42. Wilhelm Kåge, a stoneware sculpture of a dragon puppy, Gustavsberg studio, Sweden 1940-50's. 43. Wilhelm Kåge, a large faience dish, Gustavsberg studio, Sweden 1951. 44. Wilhelm Kåge, a Farsta stoneware vase, Gustavsberg Studio, Sweden 1950's. 45. Wilhelm Kåge, a Farsta stoneware vase, Gustavsberg studio, Sweden 1959. 46. Wilhelm Kåge, a Farsta stoneware vase, Gustavsberg studio, Sweden 1955. 47. Berndt Friberg, a stoneware vase, Gustavsberg studio, Sweden 1952. 48. Berndt Friberg, a stoneware vase, Gustavsberg studio, Sweden 1959. 49. Berndt Friberg, a stoneware vase, Gustavsberg studio, Sweden 1958. 50. Berndt Friberg, a stoneware vase, Gustavsberg studio, Sweden 1965. 51. Berndt Friberg, a stoneware vase, Gustavsberg studio, Sweden 1960. 52. Berndt Friberg, a set of three stoneware vases, Gustavsberg studio, Sweden 1961-67. 53. Berndt Friberg, a stoneware jar and cover, Gustavsberg studio, Sweden 1960. 54. Berndt Friberg, a stoneware vase, Gustavsberg studio, Sweden 1964. 55. Berndt Friberg, a stoneware vase, Gustavsberg studio, Sweden 1968. 56. Berndt Friberg, a stoneware vase, Gustavsberg studio, Sweden 1955. 57. Berndt Friberg, a stoneware vase, Gustavsberg studio, Sweden 1963. 58. Berndt Friberg, a stoneware vase, Gustavsberg studio, Sweden 1965. 59. Berndt Friberg, a stoneware vase, Gustavsberg studio, Sweden 1973. 60. Berndt Friberg, a stoneware vase, Gustavsberg studio, Sweden 1968. 61. Berndt Friberg, BERNDT FRIBERG, a stoneware vase, Gustavsberg studio, Sweden 1962. 62. Berndt Friberg, a stoneware vase, Gustavsberg studio, Sweden 1956. 63. Berndt Friberg, a stoneware vase, Gustavsberg studio, Sweden 1973. 64. Berndt Friberg, a stoneware vase, Gustavsberg studio, Sweden 1968. 65. Berndt Friberg, a stoneware vase, Gustavsberg studio, Sweden 1954. 66. Berndt Friberg, a stoneware vase, Gustavsberg studio, Sweden 1965. 67. Berndt Friberg, a stoneware vase, Gustavsberg studio, Sweden 1957. 68. Berndt Friberg, a stoneware vase, Gustavsberg studio, Sweden 1967. 69. Berndt Friberg, a stoneware vase, Gustavsberg studio, Sweden 1965. 70. Stig Lindberg, a stoneware sculpture "The Sisters”, Gustavsberg studio, Sweden 1940's. 71. Stig Lindberg, a stoneware figurine "Springare", Gustavsberg, Sweden 1952-72. 72. Stig Lindberg, a "Springare" stoneware sculpture of a horse, Gustavsberg studio, Sweden 1952-72. 73. Stig Lindberg, a stoneware vase, Gustavsberg studio, Sweden 1963. 74. Stig Lindberg, a stoneware vase, Gustavsberg, Sweden 1960. 75. Stig Lindberg, a stoneware vase, Gustavsberg Studio, Sweden 1966. 76. Stig Lindberg, a stoneware art object/vase and a vase, Gustavsberg studio, Sweden 1960 and 1964. 77. Stig Lindberg, attributed to, a set of three stoneware wall sculptures, Gustavsberg studio, Sweden 1960's. 78. Stig Lindberg, a large stoneware jar, Gustavsberg studio, Sweden 1960. 79. Stig Lindberg, STIG LINDBERG, a stoneware vase, Gustavsberg studio, Sweden 1970. 80. Tyra Lundgren, a creamware urn, Rörstrand, Sweden, ca 1930. This model was included in the 1930 Stockholm exhibition. 81. Isaac Grünewald, a stoneware vase, Rörstrand, Sweden 1943. 82. Carl-Harry Stålhane, a unique stoneware vase, Rörstrand, Sweden 1947. 83. Carl-Harry Stålhane, a large stoneware vase, Rörstrand, Sweden 1940-50´s. 84. Carl-Harry Stålhane, a large stoneware vase, Rörstrand, Sweden 1950's. 85. Carl-Harry Stålhane, two stoneware vases, Rörstrand, Sweden 1950's. 86. Gunnar Nylund, a stoneware jar with cover, Rörstrand, Sweden 1940's. 87. Gunnar Nylund, a stoneware sculpture of "Androcles and the lion", Rörstrand, Sweden 1950's. 88. Gunnar Nylund, GUNNAR NYLUND, a large stoneware vase, "Air Force", Rörstrand, Sweden 1950's. 89. Hertha Hillfon, a glazed terracotta sculpture of a face, Stockholm, Sweden. 90. Hertha Hillfon, a stoneware sculpture, Sweden 1950's. 91. Hertha Hillfon, a blue glazed ceramic sculpture of a chain, Sweden. 92. Hans Hedberg, a faience egg, Biot, France. 93. Hans Hedberg, a faience sculpture of a green apple, Biot, France. 94. Hans Hedberg, a faience sculpture of a bitter orange, Biot, France. 95. Hans Hedberg, a faience vase, Biot, France. 96. Hans Hedberg, a faience and bronze sculpture of cherries, Biot, France. 97. Ulla & Gustav Kraitz, a glazed stoneware sculpture of an apple, Fogdarp, Förslöv, Sweden 1984. 98. Michael Schilkin, a stoneware sculpture of a polar bear, Arabia, Finland 1945. 99. Birger Kaipiainen, a stoneware dish, Rörstrand, Sweden 1950's. 100. Birger Kaipiainen, a stoneware, blue glass and mirror glass sculpture, "Napoleon's table", Finland ca 1969.